Promoting Strategies to Keep Food Waste Out of Landfills through technical assistance and training to reduce the generation of wasted food by households, promote backyard composting, and evaluate the feasibility of food rescue and donation in rural areas of Maine, New Hampshire, and Vermont. Project funded by the USDA. Funded by NEWMOA's members and support from the U.S. EPA. NEWMOA's Workgroup prepared a summary of available Food Waste Calculators that it periodically updates as new calculators become available. The food waste component, in particular, presents unique management challenges for state and local governments. There are significant opportunities to promote waste reduction and increase diversion of these materials from disposal in landfills and incinerators. The technologies for converting these wastes to energy through AD are rapidly improving, and there is growing interest in expanding composting capacity in the northeast. State environmental agencies in the region have been receiving applications for new AD and composting operations. The agencies are working with local governments and waste haulers to address challenges with food waste and other organic waste collection and storage. 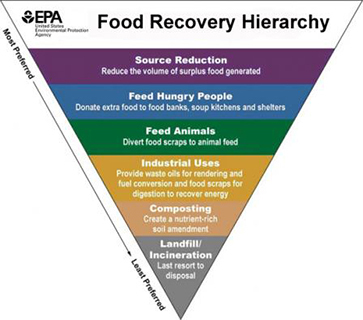 NEWMOA is an endorser of EPA's Food Recovery Challenge Program and supports EPA's Food Recovery Hierarchy.